Holley 4-barrel race carburetors feature the popular "double-pumper" design. 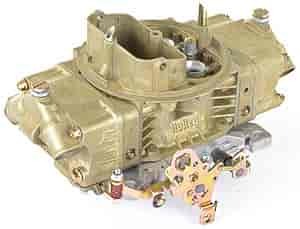 The mechanical secondaries, annular boosters with built-in fuel filter system and the double 30cc accelerator pumps make this an excellent racing carburetor. These carburetors have a dual feed fuel inlet setup with a four-corner idle system for a smooth operating carburetor. All carburetors come with a dichromate finish for corrosion resistance, which means long lasting dependability. All Holley carburetors are 100% wet-flow tested and calibrated before shipping to help ensure you get a high quality product the first time! Assembled by JEGS professionals, kits include carburetor, fuel log, and fuel pressure gauge.